(Nanowerk News) Researchers at Helmholtz-Zentrum Berlin (HZB) and The University of Tennessee Knoxville (UTK) developed a novel method, based on energy-selective neutron imaging for visualization of crystalline phase distributions within the bulk of metallic samples. The method overcomes limitations of existing techniques which are limited to the surface or small-sized specimens, and allows a 3-D representation of the phase fractions within the sample volume. The work has just been published in the journal Advanced Materials ("3D Mapping of Crystallographic Phase Distribution using Energy-Selective Neutron Tomography"). 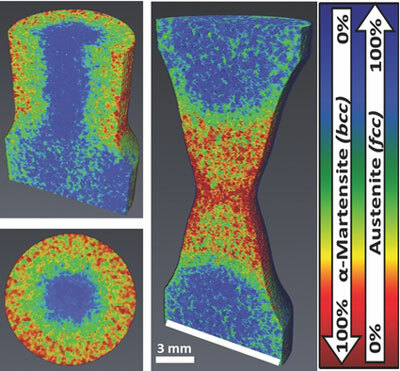 Reconstructed energy-selective neutron tomography: Visualization of austenite and martensite distribution in torsion (two images to left) and tensile (image to the right) loading. “For many engineering applications it is of major importance to characterize the bulk of materials spatially, instead of only probing selected locations. The new method provides exactly that capability, and the HZB-UTK team has demonstrated it by using samples made from stainless steel that undergo a phase transformation after being subjected to tensile and torsional deformation.”, said Prof. Dayakar Penumadu from UTK. He and UTK Ph.D. student Robin Woracek collaborated with the researchers Ingo Manke, Nikolay Kardjilov and André Hilger from the Imaging Group at the Institute of Applied Materials (F-IAM) at HZB on establishing new quantitative imaging methods by making use of diffraction contrast due to Bragg scattering in polycrystalline materials. Since the measurement method uses neutrons of selected wavelengths, the current work will also pave the way to implement such methods at Spallation Neutron Sources. The investigations were performed at the recently upgraded neutron imaging beamline CONRAD at BERII, which provides optimal instrumentation conditions for such measurements. The present results provide phase fractions of Austenite and Martensite within the volume of the circular samples. They had a diameter of 8 mm, and CONRAD allowed measuring five samples simultaneously. The tensile samples show highest degree of phase transformation in the necking region as expected, while for the torsion samples the phase transformation increases from the center towards the surface in the radial direction. The quantitative results were confirmed and show excellent agreement for selected locations, using the Residual Stress Analysis and Texture Diffractometer (E3) at the Department Microstructure and Residual Stress Analysis (F-AME) at HZB (collaborator M. Boin). The investigated stainless steels are widely used, e.g., as automotive and aerospace structural alloys, for major appliances, household items and buildings. The new characterization method can be used to improve both material properties and manufacturing processes. However, the same method is naturally applicable to a wide range of natural and advanced materials, and it has the invaluable advantage of being able to reveal inhomogeneities within the measured volume, which may remain undetected using common techniques. This new characterization technique is expected to have a major immediate impact in developing super-elastic and shape memory alloys, which are of tremendous importance in the medical field also.